"They Hunt Butterflies, Don't They?" Except for one story, that is. 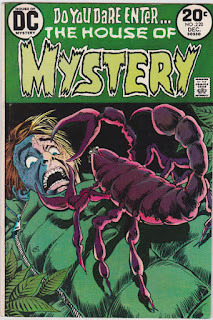 Everyone has those certain horror tales which take root in the fertile unconsciousness of childhood to become dark flowers as they grow older, and one of those nasty little seeds for me was the titular story to House of Mystery's issue 220, entitled "They Hunt Butterflies, Don't They?". The twist at the end of this one is particularly unsettling and I love it! Keep buying those old comics everyone.